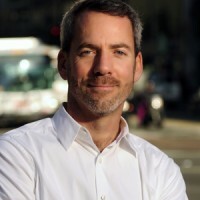 Jeffrey Tumlin is the director of strategy at Nelson\Nygaard Consulting Associates, a San Francisco-based transportation planning and engineering firm that focuses on sustainable mobility. He also served as Interim Director of the new Oakland Department of Transportation. For more than twenty years, he has led station area, downtown, citywide, and campus plans, and delivered various lectures and classes in 20 U.S. states and five other countries. His major development projects have succeeded in reducing their traffic and CO2 emissions by as much as 40%, and accommodated many millions of square feet of growth with no net increase in motor vehicle traffic. These projects have won awards from the U.S. General Services Administration, Institute of Transportation Engineers, American Planning Association, American Society of Landscape Architects, Congress for the New Urbanism, and Urban Land Institute. He is the author of Sustainable Transportation: Tools for Creating Healthy, Vibrant and Resilient Communities (Wiley, 2012).